Washington, DC – Jan. 12, 2017 – Every single day, T-Mobile (NASDAQ: TMUS) is relentlessly advancing, improving and growing its 4G LTE network. Over a year ago, the Un-carrier began aggressively preparing to serve the more than one million anticipated attendees at the Presidential Inauguration in Washington, DC with the country’s fastest LTE network. All of the resulting upgrades have permanently increased the Un-carrier’s 4G LTE capacity in the areas surrounding the National Mall by nearly 1,000% since last year! more than doubling backhaul on many sites. For additional, temporary capacity, T-Mobile has also deployed LTE-enabled cell sites on-wheels (COWs) which will be in place for several days prior to and following the inauguration. 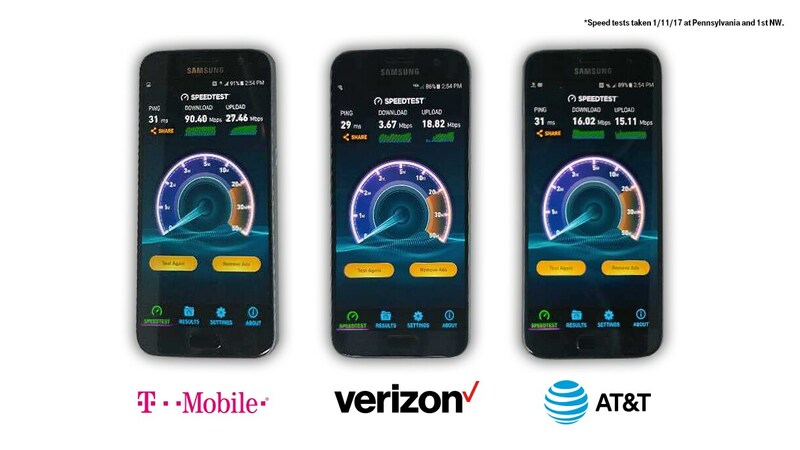 Already, T-Mobile’s preparations for the Republican National Convention and Democratic National Convention last year gave Un-carrier customers the fastest speeds at those events, and customers at the Inauguration should expect nothing different. The Un-carrier’s LTE network is the nation’s fastest – according to multiple sources, not paid consultants – and the nation’s most advanced with more LTE Advanced technologies deployed than any other US wireless provider. In fact, T-Mobile achieved a global first – which is yet to be matched in the US – with the rollout of 4x4 MIMO and 256 QAM last fall. For more information on T-Mobile’s network, visit www.t-mobile.com/coverage. Capable device required for Extended Range LTE, three carrier aggregation, 4x4 MIMO and 256 QAM. As America's Un-carrier, T-Mobile US, Inc. (NASDAQ: TMUS) is redefining the way consumers and businesses buy wireless services through leading product and service innovation. The Company's advanced nationwide 4G LTE network delivers outstanding wireless experiences to 71.5 million customers who are unwilling to compromise on quality and value. Based in Bellevue, Washington, T-Mobile US provides services through its subsidiaries and operates its flagship brands, T-Mobile and MetroPCS. For more information, please visit http://www.t-mobile.com. T-Mobile Permanently Increases 4G LTE Capacity in DC by Nearly 1,000% Ahead of the Inauguration. Link to view and download the asset in the Media Library.